A still from the video footage, released Tuesday, of Laquan McDonald after being shot by Chicago Police Officer Jason Van Dyke, Oct. 24, 2014. Laquan McDonald died at age 17 on Oct. 24, 2014, when Chicago Police Officer Jason Van Dyke shot him 16 times on a street on the city’s Southwest Side. Investigators with the state’s attorney’s office looking into McDonald’s death first reviewed video footage of the incident, which was captured on a squad car dashboard camera, a little less than two weeks later. But the video that showed what happened was not made public. And until last week, the city of Chicago was fighting to keep it that way, on the grounds that releasing the video would taint the ongoing investigation. It was only after a Cook County judge ruled Nov. 19 that the video had to be made public under Illinois’ open-records law that Mayor Rahm Emanuel agreed to stop trying to block its release. Tonight, just a few hours after the police officer who fired those 16 shots was charged with first-degree murder, the video was finally released. The video footage, which is extremely disturbing and is widely expected to provoke intense demonstrations in Chicago, can be viewed below. McDonald’s final moments can be seen starting around the 4:30 mark. At a press conference that preceded the release of the video, Emanuel asked Chicago residents to “rise to the moment this incident demands” and to be peaceful and calm in their demonstrations. Emanuel added that the officer in the video had “violated the standards of professionalism” and “basic moral standards” and noted that he was no longer being paid by the city of Chicago. Per an account of McDonald’s death provided by a lawyer for the city, Van Dyke was responding to a call about a man with a knife who was allegedly trying to break into vehicles in a trucking yard and had been following McDonald for about half a mile when the boy stabbed the tire of a squad car with his knife and damaged its windshield. McDonald had ignored orders from the police officers and had refused to drop his knife. 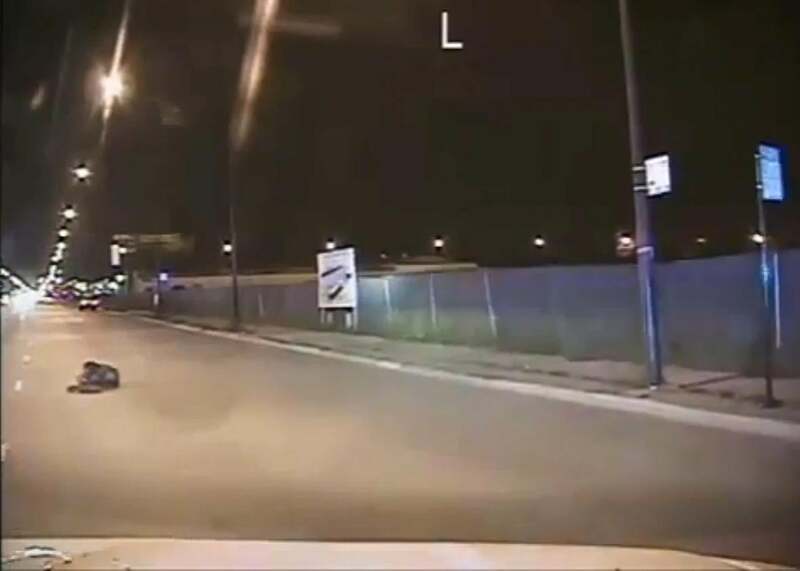 According to Cook County State’s Attorney Anita Alvarez, who gave a press conference on Van Dyke’s arrest earlier today, McDonald was walking down the middle of the street when Van Dyke and his partner jumped out of their squad car, guns drawn, and Van Dyke opened fire at McDonald. In the video, you can see that McDonald is clearly moving away from Van Dyke when Van Dyke shoots him. The Chicago Tribune reports that the police department has “ordered most of its force into uniform and warned them of potentially longer hours and canceled days off” in anticipation of the video’s release. And according to the Sun-Times, Chicago Public Schools Chief Education Officer Janice Jackson has sent a letter to parents saying administrators had developed a “special toolkit” for students who are upset by the video. “This footage is sure to raise many emotions among our children, and we want you to know that CPS will do everything possible to meet their needs,” Jackson wrote in the email. This post has been updated to include the full video.